Documents released to Der Spiegel, days after the 50th Anniversary of the Berlin Wall, show how West Germany wanted to avoid it. 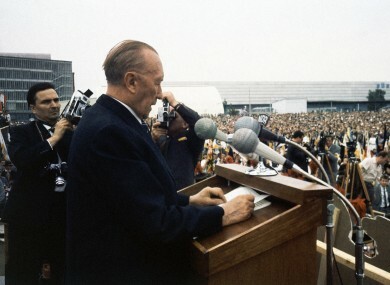 West German chancellor Konrad Adenauer was willing to swap West Berlin for land inside the East German border. THE CHANCELLOR OF West Germany was so anxious to avoid the partition of Berlin that he offered to swap West Berlin for parts of East Germany, new diplomatic documents have revealed. Documents released to Der Spiegel outline how the then-Chancellor Konrad Adenauer made the offer to the Soviet ambassador on 16 August 1961, just three days after the East had begun to erect the fencing that ultimately became the Berlin Wall. Adenauer told Andrei Smirnov that he did not want to stop the Wall – notionally constructed by the East to stop fascism spreading in from West Berlin – from being built, saying he would have liked East Germans to keep to their own side of the international border. In order to stop East Germans from defecting via West Berlin, and to ensure that Berlin was not permanently halved, Adenauer therefore proposed that Berlin be reunited under Eastern control – with the West taking some East German land elsewhere as an exchange. Adenauer had previously told other Allied leaders that there was no prospect of a reunification “for the foreseeable future”. The proposal, which was also put to the United States, would have seen the province of Thuringia and parts of Saxony and Mecklenburg in exchange for allowing West Berlin to be absorbed into the East. Germany marked the 50th anniversary of the wall’s construction last Saturday. Email “West Germany 'wanted to swap West Berlin for part of East' - documents”. Feedback on “West Germany 'wanted to swap West Berlin for part of East' - documents”.